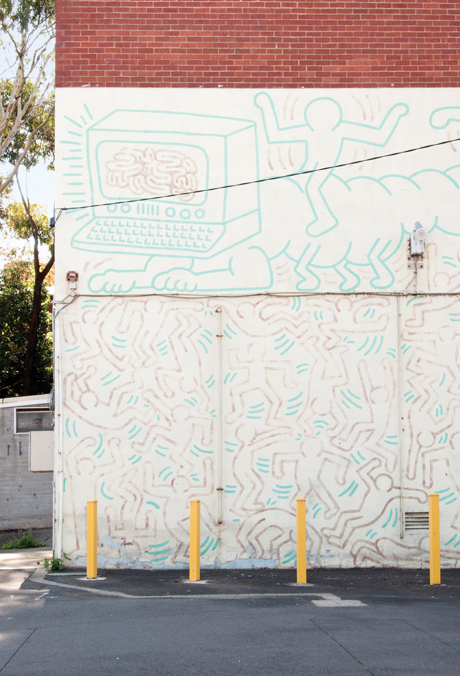 Twenty-seven years later and the vibrant mural painted by the late US artist, Keith Haring, in Collingwood, Melbourne lies pale and washed out. A faded message from 1984. The mural took a day to paint, in front of a crowd of students and local residents. In bold Haring style, it depicts a giant worm with a computer screen brain above a group of dancing figures. He’d been invited to Australia by John Buckley, the inaugural director of the Australian Centre for Contemporary Art (ACCA), and during his three-week visit Haring completed a few other works around the city, but the Collingwood Technical College artwork is the only remaining permanently-sited public piece from his visit. Haring painted a number of murals worldwide, but could never have predicted the furore and frustration that this particular artwork would generate in the coming years. The mural has received little care over the years and now, with Circus Oz due to move into the premises, the debate about its future has resurfaced, revealing two very distinct camps. On one side are conservators, headed by Victorian Arts Minister, Premier Ted Baillieu, who intends to roll out a long-term $1 million conservation plan to preserve the mural in its current state. On the other side is a growing crowd who claim that it should instead be repainted and therefore restored to its former glory. It begs the question, what was Haring’s intention with this artwork? Hannah Matthews, a contemporary art curator at ACCA, explains that conserving the mural in its current state directly contravenes the wishes of the Keith Haring Foundation (established by the artist before his death). “The Foundation has publicly requested that a suitably qualified professional sign writer repaint the original image in consultation with an arts conservator to ensure quality control,” she explains. “The Foundation’s view is consistent with the treatment of other Haring murals around the world. There are no other public Haring murals where remnants have been conserved rather than repainted.” Matthews, along with an informed group of like-minded locals (and internationals), has been publicly campaigning for the mural to be repainted for the past three years and is adamant that Haring’s wishes should be upheld. Perhaps it all boils down to appearances. Although it may appear respectful to Haring’s original brushstrokes, conserving the artwork in its dilapidated state may not necessarily give the deserved credit to Haring’s work as he intended it; instead, it may neglect the vibrancy and vitality that gave the mural its life in the first place. In its prime, the mural was bold, idiosyncratic and epitomised his characteristic use of colour. It was never about his brushstrokes. 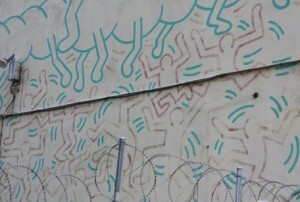 Keith Haring mural in Collingwood. Images are copyright of Mishy Lane.